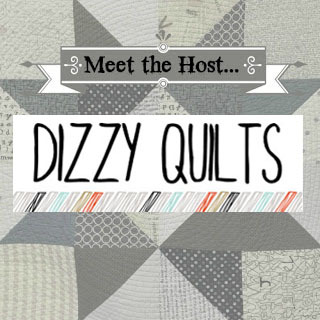 Hi - I'm Izzy from Dizzy Quilts and it's my turn to tell you a little about myself! I'm a mother, step-mother and foster mother to six children, grand-mother to one gorgeous little girl and wife to my soul mate. During the day, I manage a team of e-Learning designers/developers at a global financial company. All of this keeps me pretty busy, but I've always made time to be crafty - when I was a little girl, my mom taught me how to knit and I made all my teddy bears knitted sweaters! During my teenage years, I was a little too busy with school (and with boys!) to craft, but a few years later, when I had my first child, I started sewing. I made some baby clothes and I made curtains mostly. I even took a sewing class to learn how to make garments for myself, but I never got the hang of that - nothing ever really fit right. About 9 years ago, I walked into JoAnn's to get fabric for new curtains and spotted the cutest little quilt kits. I bought one, put it together and haven't looked back since! I was completely and totally hooked. The first few quilts I made were very traditional - lots of small pieces, small florals, etc. I really had no clue what I was doing, but learned so much with the making of these quilts. I started making these quilts for pretty much everyone in my family. And pretty soon, every bed in the house had a quilt on it. 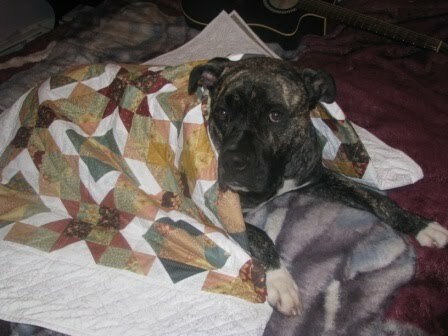 Quilt I made for my sister-in-law - this is Bronx testing it. I even made quilts as curtains!! 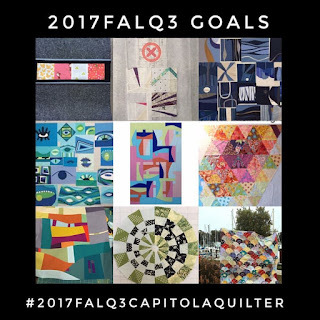 Around 2010, I discovered quilt blogs and the online quilting community. That literally changed my quilting life!! 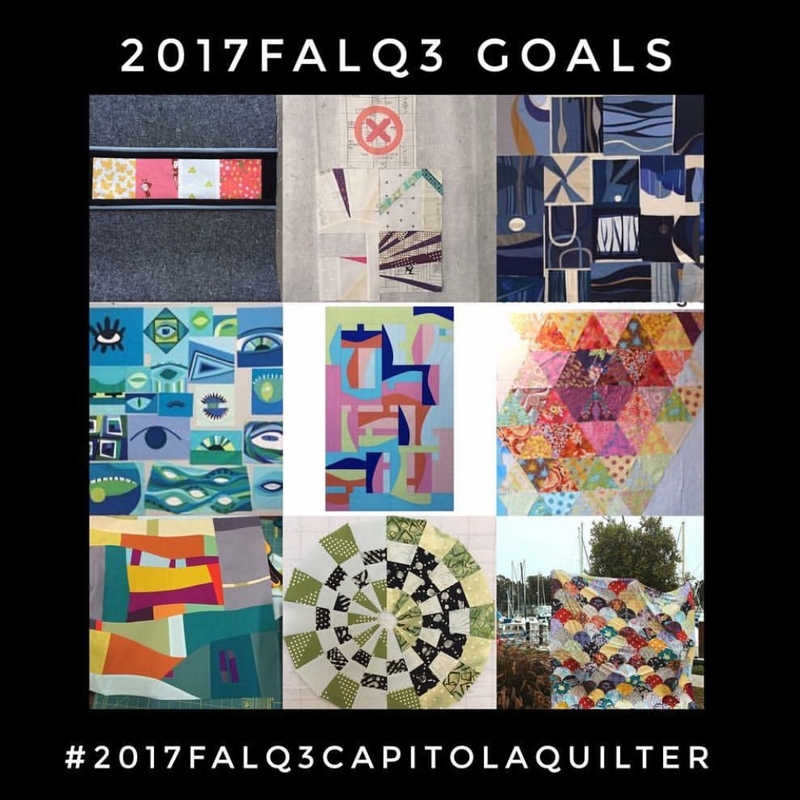 I started my own blog, met some amazing people and a couple of years later, found the Montreal Modern Quilt Guild. 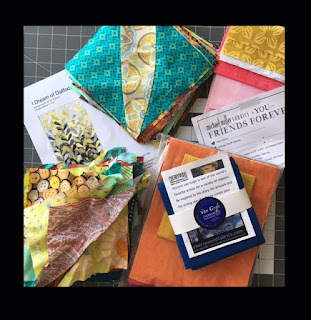 Through the members of this guild, I learned about modern quilting and I fell in love with quilting all over again. I started making modern quilts and building a stash of really colourful fabrics and solid neutrals. When I first started quilting, my least favourite part of the whole thing was the actual quilting. My sewing machine was pretty small and wrestling with a big quilt in that tiny little space was painful and I very often ended up with puckers on the back of my quilts. And then I changed two things: my sewing machine and my basting method. I purchased my Juki TL-2010Q. It is literally a dream to quilt with. Lots of room to the right of the needle and super consistent, fast stitching. And now quilting is actually my favourite part. I look forward to finishing a top just so I can get to the quilting. My dream is to some day own a long-arm machine, but I would need to get a much bigger house before that could happen! Last year, I became the Vice-President of the Montreal MQG and that has been a lot of fun. The group is growing and we have such amazing people and quilters. Each meeting is a great source of inspiration and I'm learning so much. When I was approached to become a FAL host last year, I was so flattered and so happy. I love hosting these link-ups - so much inspiration and so much talent every quarter. I've been seeing all of the cute summer dresses being shared on IG and was inspired to try my hand at making one for my granddaughter. She told me after a sleepover that she was going to get dressed and find something yellow "because that's Pap's favorite color on me". How cute is that! When she proudly held up a single yellow striped sock and announced that she'd found something to wear, (adorable, right?) After telling her what a great job she'd done, I offered to have her choose fabric from my sewing room and spent the day stitching things up. Notions at my house are a disorganized mess but I managed to find bias tape. 1/2" wide elastic however sent me to the store where I could not resist the little buttons too. I'll have to make a headband because they didn't look right on the dress. She was thrilled to"help" every step of the way with a photo shoot finale in the front yard when we were done. My non-quilts sewing actually started with an impromptu pillow case. There is something to be said for quick makes. It does the sewing mojo good. Hope your Summer is off to a fantastic start. I'm really enjoying the long days with natural lighting for evening sewing time. 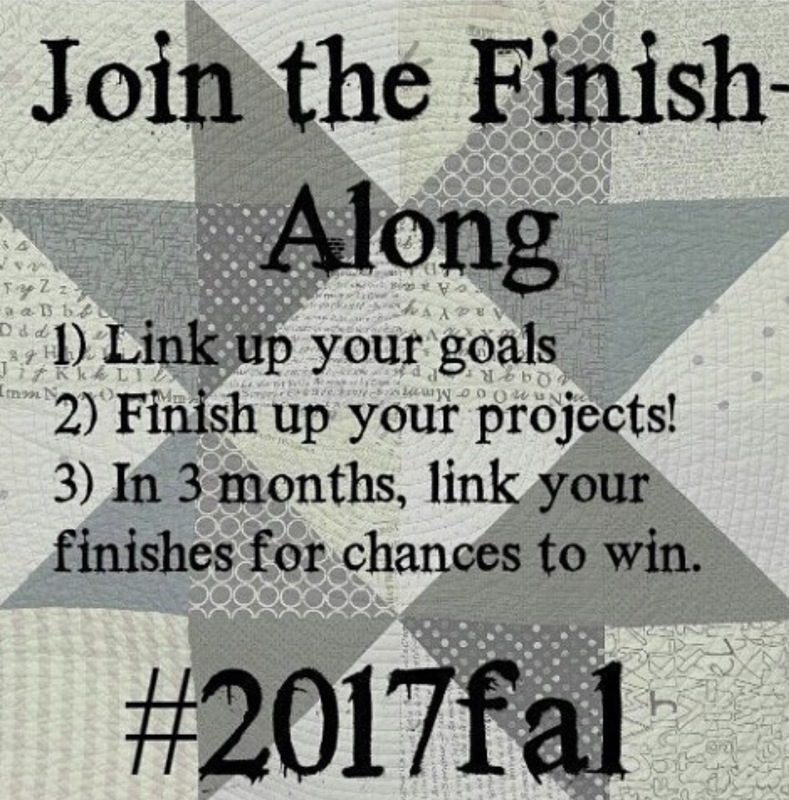 There's still a few hours left to link up your 2017 FAL Q3 Goals. I was going to stop at nine because that's how many fit in the mosaic maker I use but while rummaging around my sewing room tonight I found the project bucket from the Sujata Shah Workshop so it's an official 10 count for Quarter 3. 1. Framed Accent Strip bucket. Strip made and Essex Linen cut. Needs quilted and assembled. 2. My BeeSewcial Swap blocks. I've been playing around with designs and if I can pull it off, it's going to be great. 3. Stretch BeeSewcial 2016. Puzzling the layout with added coping areas and so on. 5. Improv Abstraction Multi-Color. Top is done and batting, backing cut to size. 6. Triangle Quilt. 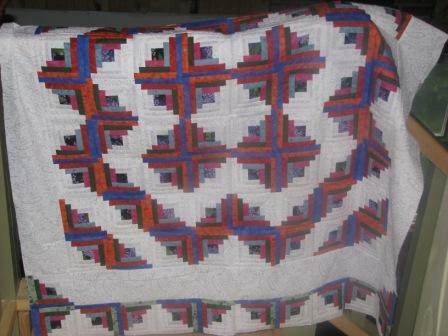 This started out as a AMH QAL years ago. It's a beautiful pattern but I'm figuring that since it's been sitting untouched I'll give myself the freedom to layout as desired. 7. Improv Pam Rocco Workshop. 8. Dresden Workshop. Another one I really enjoyed making parts but have done nothing with. Also shown are two To Do items but since I don't have any ideas in mind for the design or the mini and the other is only a block, I'm not including them in my official list. The Cherrywood vanGogh challenge deadline is August 1 so it had better get done! The Michael Miller Fabrics+You=Friends Forever block has to be received by November 10th and I'm happy to have it on my radar. So there you have it. I'm going to go head over and link up my goals HERE. You should do the same - especially since you can win some great prizes from the generous sponsor! 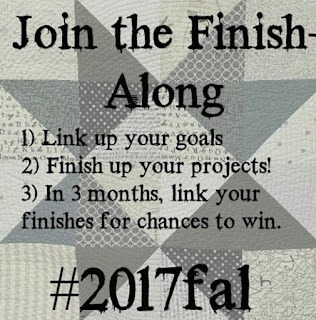 It's time to link up your list of unfinished projects that you propose to finish in Q3 of the FAL. I am looking forward to seeing what you are planning to be working on over the next quarter. It's time to round up those projects you want to finish over the next three months, take a photo of each one and make your list. Please ensure that you have at least started your projects - pulled fabric with a pattern is now considered a UFO, and remember it is only finished projects that will get you an entry toward the above listed prizes. (note to long-timers: this definition has been broadened from previous years). So while we love to see your bee blocks, the "finish" is when they are a completed, usable project. The 2017 Q23link for your list of proposed finishes is now open below on my blog and on each of the hosting blogs. You need only link your list once, on one blog - and that link will show up on all of the blogs. If you are using Facebook, Flickr or Instagram, link a mosaic and put your list in the description. Katy of The Littlest Thistle has a great tutorial on how to link-up if you need it. We also ask that you become part of the FAL community. Please check out the links of others - visit and comment on their lists. We all need encouragement to get those finishes done, so please share some of your own too. When creating your list there is one thing to remember....No deductions for not completing something so ..... Aim High! Nothing to lose!!! Well Now..... Get those lists together and get linked up.